We have 3 host hotels in Bellevue and Hailey, all are lovely and within the same price range. I suggest getting a reservation for both Friday and Saturday night, and then they can cancel once the schedule is finalized a couple of weeks before. If people want more of a resort stay, there are lots of hotels in Ketchum and Sun Valley, as well as airbnb's for rent. Suite rooms are offered for a higher rate but still at a discount. Unfortunately these rates are not bookable via on line sites such as Expedia, Hotel.com, Orbiz, TripAdvisor or Booking.com Guests will need to call the hotel at 208-578-0600. They can book on our website https://www.woodriverinn.com/ and request the group discount in the notes and we will update the rate to reflect the special. Rooms are based on availability we recommend they book early. There is a 48 hour cancellation on all reservation and we do not charge until the day of arrival. We have a fitness center, indoor pool and hot tub, and full breakfast included. ** Guests can call direct to reserve under this block, and ask for the block name. We have a discounted group rate of $99/night. We have a solar heated pool and hot tub so don't forget your bathing suits. We offer a complimentary breakfast from 6:30 am - 9:30 am. 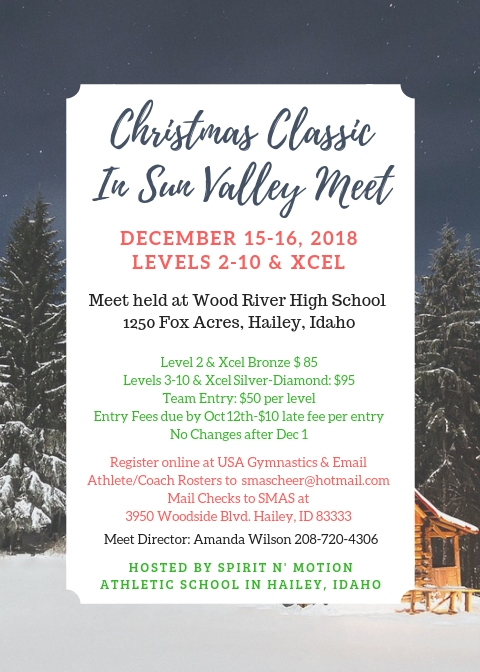 Please have your guests call and secure their rooms by mentioning Christmas Classic in Sun Valley. Reservation cutoff date is November 15th. Thank you for choosing the Silver Creek Hotel. We look forward to your arrival. Travel safe!